When I was first diagnosed, my first thought was preserving and protecting my liver, since I thought, well, it’s going to have to do a lot of work and it’s the next target for the cancer, so let’s make it as healthy and strong as possible. I was just trying for a little more time, not a cure. This category will tell you what I changed in my diet, what I added, and what I learned along the way. And yes, my liver is still healthy. I’m coming to believe that a huge part of the illnesses we suffer through – at least in the USA – comes from the incredible toxic chemical load that all of us are carrying now. Someone asked me the other day if I had any idea what caused the pancreatic cancer. My intuitive response was “chemicals.” Of course, I’ll never know but I don’t think most of us realize the soup of chemicals we live in. If you’d like to learn more in an easy format, try “Unacceptable Levels” (http://www.unacceptablelevels.com), a documentary about just this thing. It will be on Netflix soon. But in the meantime, I kept my buying of food and household products to those things least affected. If I was asked if there was any one physical thing that turned the tide for me on this disease, I’d say I think it’s been eliminating these chemicals (to the best of my ability) from my life. Of course, I can’t prove that, it’s just a hunch. In general, I dumped a lot of things from my diet: processed foods, additives – food coloring, preservatives, etc. There are so many I cannot possibly tell you everything I eliminated. If it’s meant to be stored, it probably has preservatives in it. If it’s packaged and processed, it probably has additives in it. Just because the package says organic does not mean that it is free from crap. Even doing a little research into food adulterants will make your hair stand on end. Food glue (oh yes), “natural flavorings” (just because it’s called natural doesn’t mean it is), caramel coloring (I fell for that one for years), the list seems endless. Maybe some are ok, but it’s so hard to tell the healthy from the unhealthy (and downright horrible), that I felt safest just eliminating it all. I was drinking a green drink I thought was healthy for me – from a health store – until I read the ingredients; parabens and methylparabens – these are preservatives that even the cosmetic industry is getting rid of because of their links to cancer and other diseases. A hard one for me was BSP because I love my canned tomatoes. BSP is used as a liner in canned goods to prevent degradation of the can. It probably does, but it also reacts with food, especially acidic food (like tomatoes) and leaches into your food. It is considered an endocrine disrupter. It is also on those receipts you get at ATMs, grocery stores, etc. If it has a powdery feel to it, it probably is coated with BSP. I gave up most canned food and now wash my hands after every receipt I touch. I also can my own tomatoes now, grown in my garden (deeply grateful to have the space). 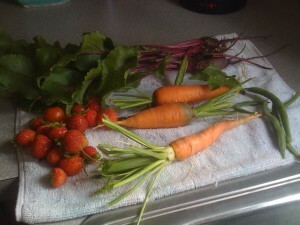 I know they are free of added chemicals, because I grow them, I pick them, I can them. And, of course, plastics. Some seem safer than others. I am by nature frugal (cheap) and I used to save my plastic containers to store leftovers in. Now I only use glass. I just save glass containers and put my food in that. Still frugal but safer. No plastic water bottles either. Keeping fresh air, fun, play, good movies, walks with the dog. Keep these, treasure these. I hear you. What is left? Really, it’s simple (but maybe not easy. Change is hard). It actually got easier because my choices were narrowed. I eat fresh food I buy and cook myself. I’m sure you’re sick of reading this one – fresh veggies, fresh fruit, grass fed, pastured meat and dairy. Can’t guarantee everything will be pure, but I think it’s my best shot. I eat organic. I know, all of this is expensive. In the post on diet, I will introduce Dr. Servan-Schreiber and his book on cancer. In it, he has list of foods that have high pesticide levels and foods that have low levels. When I shop that way, I save money. And sometimes it all just got to be too much. Then I’d tell myself, go easy. You can’t change the world in a day and probably wouldn’t want to live there if you could.